Will Missionary's Death Be a Tipping Point for U.S. Position on Cameroon Crisis? Martin Ravina Shamdasani, OHCHR spokesperson, briefs the press at the Palais des Nations in September 2018. Continuing insecurity in Cameroon has been condemned by the United Nations Human Rights Office (OHCHR) amid reports of killings by armed groups and State forces that has prompted mass internal displacement. The development follows a worsening situation in north-west and south-west Cameroon, linked to protests by English-speaking citizens against discrimination in October 2016, that escalated into violence involving secessionists and State forces. 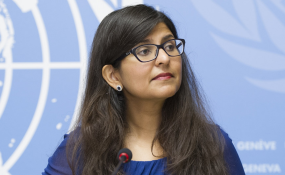 "We strongly condemn the human rights violations and abuses that have plagued the people in the north-west and south-west regions of Cameroon," said Ravina Shamdasani, OHCHR spokesperson. "We call on armed secessionists groups to refrain from the use of violence. We urge the Government to respect and protect the rights of all." Ms. Shamdasani noted that more than a year of violence in the central African nation has left populations "living in fear" and unable to access their basic human rights. The Government needed to address "long-standing grievances... including through dialogue", the OHCHR spokesperson insisted, in addition to investigating all cases of violations reportedly involving its security and defence forces and holding the perpetrators to account. Communities are at constant risk, she insisted, despite the recent announcement that secessionist militia had released dozens of young hostages from a church school in recent weeks. "In addition to the high-profile abduction and subsequent release of 78 students and three staff at a secondary school in Bamenda, in the north-west earlier this month, we regularly receive reports of abductions, reportedly carried out by the armed secessionist groups," the OHCHR official said. In the past two weeks, eight students and one school official were reportedly abducted in the south-west city of Kumba, while at least 13 nuns were also taken near the village of Bamessing in the north-west. "They were all subsequently released, after some parents paid ransoms and the Catholic diocese of Kumba intervened," Ms. Shamdasani explained. In recent months, Cameroonian armed forces have allegedly carried out a number of extrajudicial executions in the troubled north-west and south-west, OHCHR said in a statement. "On 20 October, in the village of Rom, in the north-west town of Nwa, security forces reportedly killed four villagers during a confrontation with these armed groups," Ms. Shamdasani said. "While on 24 September, two men suspected of being secessionist fighters were reportedly killed on the spot." The violence has led to mass displacement inside and outside the country, which the UN Office for the Coordination of Humanitarian Affairs (OCHA) has described as an "urgent" humanitarian concern. "In total in these areas we are talking about, there are about four million people and as we have heard, there are already 436,000 people internally displaced," spokesperson Jens Laerke said, adding that help is "slowly increasing" in the north-west and south-west. The south-west is the "epicentre" of the displacement crisis, Mr. Laerke continued, after 246,000 people fled their homes. Amid the ongoing threat of violence, securing safe access for humanitarian workers remains a major obstacle to delivering aid. But a shortage of financial support is the greatest problem, illustrated by the fact that a $15 million appeal launched in May to help 160,000 people has raised only one-third of what is required. "Lack of funding and of course the limited access - but particularly lack of funding - remain the main impediment to enable the scale-up of the humanitarian programme," Mr. Laerke said. The overall 2018 Humanitarian Response Plan for Cameroon which amounts to $320 million is less than 37 per cent funded.